The following article, written by Seeta Persad, appears in the Trinidad and Tobago Newsday, March 30, 2012. The nation today celebrates, with a public holiday, the collective right of the people to freely worship in the religion of their choice, and specifically the struggle and eventual victory of the Spiritual and Shouter Baptist community to secure that right for themselves. It was in 1996 that the Government granted a public holiday, called Spiritual Baptist/Shouter Liberation Day, in commemoration of the repeal of the prohibition act, which had prevented Spiritual and Shouter Baptists from openly practicing their religion. Trinidad and Tobago remains the only country globally that celebrates a public holiday for those following the Spiritual Baptist faith. The doors of the Holy Faith Spiritual Baptist Tabernacle in La Horquetta will be opened for the entire day today as the faithful unite for a day of worship. Other Baptist churches that will be marking this Holiday with prayer include Garazin Shouter and Baptist Church Ltd of Sangre Grande, Baptist Church Centre in Princes Town, Beth’aleel Fundamental Baptist Church in San Fernando, Bon Air Full Gospel Baptist Church in Mausica, Dickson’s Memorial Baptist Church in San Fernando, First Baptist Church in San Fernando, Monte Grande Baptist Church in St Augustine, Mount Hope Spiritual Baptist Church in Port-of-Spain, Mt Pisgah Spiritual Baptist Church in Santa Rosa. According to author Hazel Ann Gibbs De Peza, who is a practising Shouter Baptist, the Spiritual Baptist Faith is the name given to the Christian religious group emerging among the Africans in the 19th century in Trinidad. In 1917 the group was outlawed by the Shouter Prohibition Ordinance against its mode of worship which was considered “too noisy” and “too African” and therefore uncivilised and unacceptable. It suffered legal persecution and prosecution until the ordinance was repealed in 1951. Gene Toney sings some examples of Trumpets, short hymns sung by members of the Spiritual Baptist Faith. Caribbean Life News reports on the celebrations of Phagwah in New York. Mageeras, dhantals, and drums accompanied chowtal singers featured in the Phagwa celebration on March 7 at the Consulate headquarters in New York. The Phagwa or Holi festival, which celebrates the advent of Spring and the destruction of the demoness Holika, coincided with a welcome rise in temperatures in New York. The Phagwa celebration is the second in a series of events co-organised by the Interfaith committee comprising spiritual leaders of different faith under the auspices of the Consulate. Upcoming events include Shouter Baptist Day, which will be celebrated on March 29 and an Interfaith and Thanksgiving Service to commence the celebration of the 50th anniversary of Independence of the Republic of Trinidad and Tobago on April 14 at York College, Performing Arts Center, Jamaica, N.Y.
For the full original report: Chowtal & Phagwa at T&T Consulate • Caribbean Life. The following you tube videos show segments of the Phagwah celebrations, 2011, Smokey Park Queens New York. Tangerine Clarke reports on the Phagwah festivities in Queens New York, for Caribbean Life. The sunny, warm weather on Sunday, March 11 certainly complemented the arrival of spring in the Hindu calendar, that was celebrated at the 24th Annual Phagwah Festival in Richmond Hill, Queens. Also known as Holi, the festival attracted an estimated 25,000 Indo-Caribbean nationals who lined Liberty Avenue to witness beautifully decorated floats, and revelers who danced to the sound of recorded Indian music and tass drumming. Many on foot were dressed in traditional Indian regalia, carrying banners and flags that represented their rich cultural heritage. Young and old got into the merriment of throwing colored dyes on each other to celebrate the colorful flowers in bloom in the spring season. The white clothes and faces of the festival goers were covered in the “Abrac” powder in red, yellow, blue, green and pink. Traditionally celebrated on the first Sunday after the first full moon on the Hindu calendar, Holi also celebrates the triumph of good over evil and the welcome of the New Year. The festival culminated with a spectacular cultural presentation in Smokey Oval Park in Richmond Hill. For the original report: Queens residents celebrate Phagwah • Caribbean Life. In the October 2009, I had the pleasure of witnessing a riveting performance of La Troupe Makandal, led by Frisner Augustin, in Providence, Rhode Island. In the following article, published in World Music Central, A Romero announces the passing of master drummer Augustin, and gives an account of his musical journey. Haitian musician Frisner Augustin passed away on February 28th, 2012 at Bernard Mevs Hospital in Port-au-Prince (Haiti). He died of a brain hemorrhage. Frisner Augustin was the artistic director and master drummer of La Troupe Makandal. 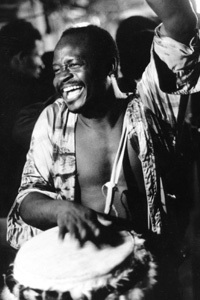 Frisner Augustin was the artistic director and master drummer of La Troupe Makandal. “Frisner was an ountògi, a master drummer of Vodou. He was an oungan sou pwen, that is, on the point of the Vodou priesthood,” said Lois Eileen Wilcken, executive director of La Troupe Makandal. Frisner Augustin was born March 1, 1948, in Port-au-Prince, Haiti. His father, Julien Augustin, was an itinerant carpenter. Most of the time his mother, Andrea Laguerre, and her mother, Rose Laguerre, raised him. Frisner’s mother occasionally produced industrial crafts and tourist items; at other times she was unemployed, and the family struggled to survive. His family could not afford to send him to school. As an apprentice maman drummer, Augustin had to go through an initiation ceremony that prepared him for the responsibilities of “making the drum talk.” The first drum he received was a burned-out mahogany shell onto which he had to attach a drum head. Putting the head on a drum is a ritual “presided over by the spirits.” A shaved, wet goat or cow skin is placed over the wooden shell and allowed to dry overnight. The next day the skin is tied and tightened around wooden pegs, and holes are cut into the drum body. Through this initiation ceremony the drummer communicates with the spirits. Concurrent with his participation in Vodou ceremonies, Augustin continued attending welding school and was able to help support his family. In 1961, he was invited to join a drum troupe traveling to Puerto Rico and began earning his living from drumming. In 1972 he emigrated to New York (United States of America), where he established himself as a master drummer in Vodou rituals, as a performer for Haitian community festivals, and as a drum instructor. In 1981 Mr. Augustin took over the direction of the company La Troupe Makandal. His recordings with the Troupe, A Trip to Voodoo, Erzili, and The Drums of Vodou, feature his settings of traditional Afro-Haitian dances. He has recorded as well for jazz artist Kip Hanrahan and for the soundtrack of the film Beloved. In addition to performing in theaters, galleries, festivals, and educational venues, Mr. Augustin taught a workshop in Haitian drumming at Hunter College, the Krik! Krak! workshop for children at three sites in Brooklyn, and classes and lecture-demonstrations through the Brooklyn Arts Council and City Lore. He also worked with the Haitian-American children’s dance company Tonel Lakay. Clearly aware of the negative stereotyping of Vodou, Maestro Augustin used his drum to recast the mystery of the religion from a positive perspective. Because of his dedication, he received a People’s Hall of Fame award from the cultural center City Lore, and a Certificate of Achievement from the National Coalition for Haitian Rights. In 1999 the National Endowment for the Arts awarded him a National Heritage Fellowship, the United States of America’s highest honor in the folk and traditional arts. For the original posting: Haitian Master Drummer Frisner Augustin Dies | World Music Central.org.